SeaCasas carries fun, theme-inspired office accessories and art that will keep you excited about your work. We are all about energizing spaces and inspiring smiley faces. 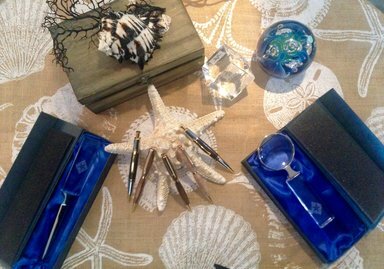 Crystal and exotic wood letter openers, assorted paper weights, hand-tooled writing pens and crystal edged magnifying glass – to create a unique office setting for your creative space.